Even from afar, you can help the Galapagos Islands preserve its unique flora and fauna and be a part of vital on-going research with your donation – all from your home. A number of international organizations fund projects in the Galapagos. 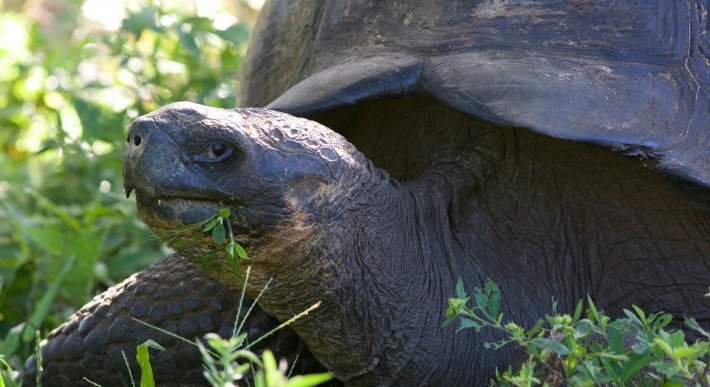 Not only is the recovery of giant tortoise populations on the islands’ agenda. Studies in the diversity of sharks recently gave rise to the Ecuadorian government declaring a shark sanctuary around Darwin and Wolf Islands. Research into the infestation of nests by the parasitic fly, Philornis downsi, has given new promise to saving the mangrove finch from extinction. Founded in 1959, the Charles Darwin Foundation (CDF) has been in the Galapagos Islands longer than any other organization. Since 1964, it has operated the Charles Darwin Research Station, a popular stop for visitors to Puerto Ayora on Santa Cruz Island. It works closely with the Galapagos National Park, and national and international scientists in the breeding of critically endangered species like land iguana, tortoises, and mangrove finch. It also aids in environmental education, training naturalist guides, and identifying and eradicating invasive species. The CDF is a Belgian-registered International Non-Profit Association. Galapagos Conservancy is focused exclusively to the conservation of the Galapagos Islands’ distinctive wildlife and vegetation. For over 25 years, it has been helping to fund a wide array of on-the-ground research that aids in conservation management, public policy and sustainable initiatives. It supports Galapagos, national and international organizations. Two of its big projects now are the revival of the Pinta and Floreana giant tortoise species, and saving the Mangrove Finch from the brink of extinction. Galapagos Conservancy is based in the U.S.A.
Galapagos Conservation Trust (GCT) has supported conservation projects in three areas – science, education and culture – since 1995. It works with organizations and authorities to preserve Galapagos’ unique ecosystems, promote recycling in the Islands and prepare the next generation of conservationists. GCT funds projects in five areas: conservation education, conserving endangered species, controlling invasive species, marine conservation and sustainable development. GCT is based in the United Kingdom. The international organizations World Wildlife Fund and Wildaid also fund the many research and conservation efforts the Charles Darwin Research Station and Galapagos National Park are working on. Local grassroots organizations are more single-project oriented. Darwin Animal Doctors provides veterinarian services to wildlife and domesticated animals, as well as sterilization of island dogs and cats. FUNDAR Galapagos (Foundation for Alternative Responsible Development in Galapagos) focuses on education to promote sustainable development in the Galapagos. Do you know of other ways to help the Galapagos islands? Let us know in the comments below.